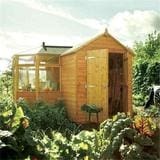 THIS SUPERBLY BUILT ROWLINSON OXFORD SHED 4 X 3 PREMIER SHED BENEFITS FROM A 20% DISCOUNT THIS APRIL. NORMAL PRICE £249.00. YOU PAY £199.20 ONLY WITH CODE OS20. FREE UK DELIVERY. OFFER VALID 1 APRIL - 30 APRIL 2019. 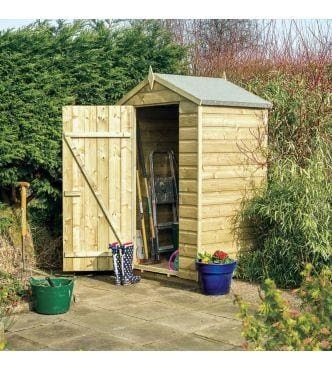 The Rowlinson 4x3 Oxford Shed is a great space saving item to store any precious garden items, safely and securely. Its traditional apex roof provides plenty of headroom and includes mineral roofing felt for extra protection. Its quality shiplap cladding is pressure treated against rot to ensure the shed lasts for years. A garden shed is the mainstay of any garden, whatever the size, and many gardeners have, until now, thought of them as utilitarian eyesores to be hidden away at the bottom of the garden where they gently disintegrate. April is an ideal time to buy a shed so that you can tidy away those garden tools & seed trays which may be in your old crumbling shed or elsewhere in the garden.It is very satisfying to look around your early Spring garden in the knowledge that a brand new shed painted in a colour of your choice will help you get organised ready for all the propagation & planting that lies ahead ! Over 500,000 sheds, mostly of wood, are sold in the UK every year and with a little thought and investigation as to what is available on the market. The ideal shed can be purchased at a reasonable price. The traditional potting shed is a serious workplace for the enthusiastic gardener, who will make a choice based on storage size and work surface area. Today’s sheds come in all shapes and sizes depending on their function. Sentry box sheds are suitable if you just want to store some garden tools whereas the purpose of Mower Stores & Bike Stores is self- evident. If you are one of the growing number of allotment holders that security can be an issue for, choose a shed that has secure fixings for a padlock. Smaller sheds of about 6ft X 4ft can cost as little as £150 ranging up to over £1000 for a Rowlinson Corner Potting Store, which combines ample storage with greenhouse facilities. Larger sheds can even be aesthetically enhanced with a green roof of shallow rooting Sedum or Turf. Most sheds are made of FSC timber, which is pressure treated to prevent rot, but if you live in a damp area, or one prone to flooding consideration, you should buy a metal shed such as a Rowlinson Woodvale shed, which comes in various sizes. Metal sheds are now attractively designed compared to the ugly structures of the past. Many articles have been written about the therapeutic effects and joy of owning and pottering around in a garden shed to escape the stress of today’s busy and high pressure lives. It is even suggested that having a garden shed can help men live longer, since growing seeds or cuttings in a shed, or just pottering around, raises self-esteem and lowers blood pressure.